The ancient Greeks sought to explain thunderstorms as resulting from the temper tantrums of Zeus who liked to hurl thunderbolts around when enraged. Not known for fidelity to Hera, his wife, the mighty god was rather fond of larking about with nubile nymphs, causing Hera considerable grief. Tempestuous were the rows which resulted. We seldom experience a thunderstorm in Summer, whereas now, as we move ever so slowly into Winter, we have had some spectacular ones, with more expected; maybe Zeus and Hera are regaining their energy in the cooler weather. Zeus rumbled and grumbled all night long, stumbling about from North to South, from West to East in an ever-changing pattern. Just as we seemed assured of a heavy downpour, the great mass of cloud shifted its attentions across the Gulf from us and a massive hailstorm destroyed almost all the almond crop in Farsala. 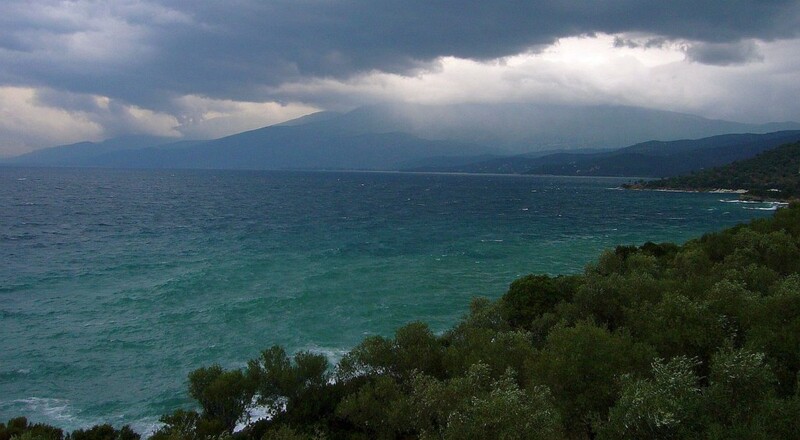 Here on the Peninsula we know better than to trust the weather reports completely, and a common response when one asks about the weather forecast is: “Look out of the window.” The Pelion Peninsula is rugged and rocky. Gorges and gullies abound. Rivers and streams flow from the mountain’s ravines, particularly during the Winter rainy season when many a summer-dry river bed can turn instantly into a raging torrent, bringing floods and landslides in its wake. The area has so many mini weather patterns that it’s probably a meteorologist’s dream, or more likely his/her nightmare but it’s always interesting. Zeus and Hera have clearly not resolved their differences this morning. Ominous black clouds sulk in the North, and though we can’t see Mt Olympus from here, I imagine the atmosphere’s pretty bad up there.